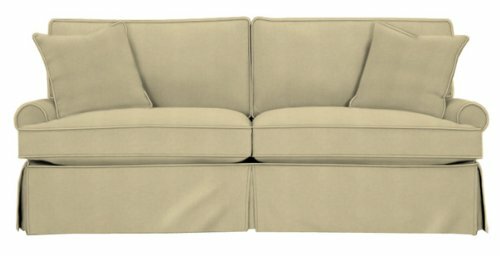 Slipcovered Queen sleeper sofa dimensions W82″ x D35″ x H37″. Queen memory foam or innerspring sleeper mattress dimensions W60″ X L71″ X H5.” Price includes matching toss pillows. Available in 100 assorted fabric choices! Price shown is for Tier 1 Euro Velvet/Microfiber/Twill option. åÊåÊ ? Seat Height 22″/ Arm Height 24″ åÊåÊ ? Select Kiln Dried Hardwood Frame åÊåÊ ? Available In 100 Select Fabrics åÊåÊ ? Guaranteed “No-Sag” Springs åÊåÊ ? Fully Removable Slipcover åÊåÊ ? Innerspring or Memory Foam Mattress åÊåÊ ? Carefully Hand-Crafted In U.S.A.